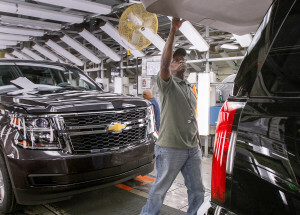 A recent Dallas Morning News article speculates that a secretive General Motors proposal to spend more than a billion dollars at its Arlington, Texas, plant could mean radical changes to the company’s SUVs. This could include aluminum bodies for vehicles made at the plant or powertrain changes similar to the Ford V-6 Ecoboost engine, the newspaper theorized. “One possibility would be a new body shop that can produce aluminum SUV bodies, which would decrease the weight of the current steel vehicles and improve fuel economy,” the Morning News reported. Right now, the plant produces the GMC Yukon and XL, the Cadillac Escalade and Escalade ESV and the Chevrolet Suburban and Tahoe. Arlington vehicles were popular in 2014, according to GoodCarBadCar tallies. Tahoe sales grew 17 percent to nearly 98,000 units, Suburbans were up 7.3 percent to about 55,000, the Yukon climbed 46.9 percent to nearly 41,600, and Escalades sold 35.6 percent more to reach more than 30,500. Even if gas prices continue to return to what consumers have grown to expect, boosting fuel economy through a package of aluminum/high-strength steel bodies and powertrain improvement might still be enough to keep drivers buying GM’s SUVs. Hoffer also speculated to the newspaper that the plant could be converted to build either trucks or SUVs there. GM has 80 percent of the full-size SUV market, according to the Morning News, and Arlington’s models are worth 30 percent of its income. So it’s not a bad example of playing to one’s strengths, particularly if the newer — and more lightweight — versions are the kind of hits that the aluminum F-150 has been for Ford. According to the Morning News, the plant could be ready for new-generation 2019 SUVs if the expansion proceeds. That gives shops who do a lot of full-size SUV work a little time to prepare.